Product Inquiry - How long does our soap last? Our soaps last about two to three weeks under average daily use. This will vary between households due to the amount of lathering used and frequency of use, as well as water type (soft or hard water). 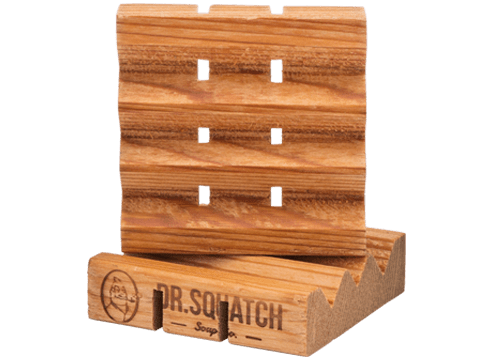 The best way to extend the life of your soap is by allowing it to dry between uses with a Dr. Squatch Soap Saver, and by storing in a place where it will dry out between use. If you're interested in extending the life of your soap bars, one method you can use to extend the life of your soaps is if you give your soap bar a small shake before placing it on a soap-saver (or similar device), this can remove excess water droplets that would otherwise be resting on the bar. The dryer your bar is, the longer the bar will last (and using a soap-saver can usually double the life of our bars). Another fun method is if you use a loofah or shower sponge/cloth to create your soap lather with the bar, this can help increase the amount of lather/suds produced and more efficiently distribute the soap. Soap mitts are another great alternative and can be great for generating additional lather. This can also extend the life of the bar as it allows a sponge or cloth to create the soap lather rather than using a bar directly under continuous running water! A cheap alternative is to use your man beard or other body hair. A true Sasquatch may find this to be the best way to generate lather!